We won 2017 Most Loved Award for Arts and Crafts Center! Listen to Amy & Richard on Bike Talk on KPFK radio. 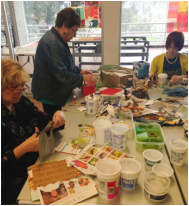 Learn to create Artist Trading Cards, cardboard collages, painting (oil & acrylic), drawing and other visual arts. 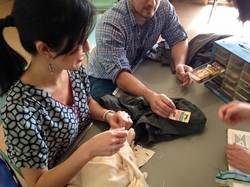 Learn to fix a hem, sew on a button, make a reusable bag, patternmaking, clothing upcycling and sewing by hand and machine. Enjoy creative crafting with household discards for adults and children. Catch Dreameco Crafts in your community! 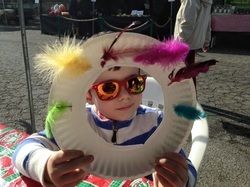 **Interested in having Dreameco Crafts at your next event? We can create one-of-a-kind activities and classes suitable for yourself, children, adults or a company mission. Send us a message at dreamecocrafts(AT)gmail(DOT)com and let's discuss opportunities. Institutions we work with include Green Communications Initiative, Camera Obscura Art Lab at 1450 Ocean, Our Time Bank, Transition Culver City, Westside Regional Repair Cafe, Hulafrog Venice-El Segundo, Mar Vista Community Council Green Tent, Motor Ave Farmer's Market, Human Ecology class at Otis College of Art and Design, Playa Vista Farmers' Market, reDiscover Center, Santa Monica Farmers Market, Trade School LA, Whittier Free Store, Yarn Bombing Los Angeles and we would love to work with you!